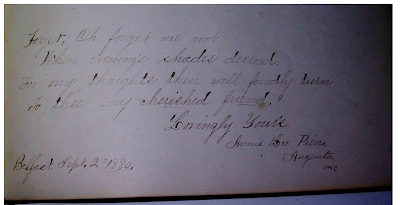 Found in an autograph album whose pages were signed mostly by students at Bradford Academy, Bradford, Massachusetts. I'm not sure whether Annie Lee Pierce was a student there or if the album was owned by a student who returned to Maine, but I suspect the latter. Annie Lee Pierce was born 28 November 1860 in Maine, the daughter of Otis and Hannah (Doe) Pierce of Maine. Her paternal grandparents were Veranus Fuller Pierce and wife Nancy (Chadwick) Pierce. Her maternal grandparents were Andrew and Abigail (Weeks) Doe. 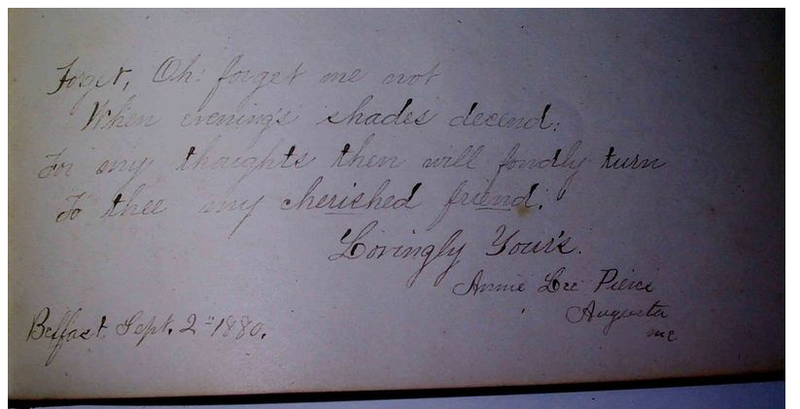 Sadly, Annie died 1 September 1885. I don't believe she had married or had children. She's buried at Augusta, Maine.